If you like to read about reading, or if you like to think about thinking, don’t miss this piece from the Sunday Boston Globe. 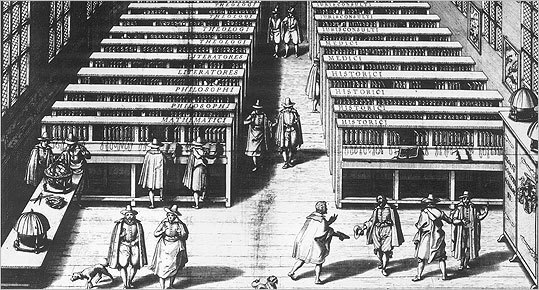 Harvard prof. Ann Blair makes some interesting observations about the history of printing and the experience of living through an information explosion. Human history is a long process of accumulating information, especially once writing made it possible to record texts and preserve them beyond the capacity of our memories. And if we look closely, we can find a striking parallel to our own time: what Western Europe experienced in the wake of Gutenberg’s invention of printing in the 15th century, when thousands upon thousands of books began flooding the market, generating millions of copies for sale. The literate classes experienced exactly the kind of overload we feel today — suddenly, there were far more books than any single person could master, and no end in sight. Scholars, at first delighted with the new access to information, began to despair. “Is there anywhere on earth exempt from these swarms of new books?” asked Erasmus, the great humanist of the early 16th century.